The international medical aid group Médecins Sans Frontières (Doctors Without Borders) said Monday that thousands of families are still struggling to find food, shelter and health care services, and remain at high risk to contract illnesses such as cholera and malaria. "At first, we were treating up to 200 patients a day in just one cholera treatment unit," said Quezia Monteiro, an MSF infectious diseases specialist. To date, MSF and Ministry of Health teams have treated more than 3,400 cholera patients in the flood-affected region. "The importance of health care is undeniable, but dignity is also key," said Joaquim Guinart, MSF's project coordinator in Buzi. 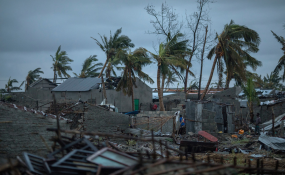 "In the days after we distributed soap and chlorine solution ... one woman thanked me, saying she had not been able to wash clothes in the three weeks since the cyclone," he said. "We are going to rebuild the city. Your hands will also help to rebuild the city. So, I think they will be useful to us."